Categories: Family, Environment, Sunday Only, International, For Kids, Paginated Pages. It may be a small world, but it's a planet filled with stories. From man-made occurrences to nature's own news, Earthweek provides a weekly overview of headline events affecting our planet. Covering cyclones, floods, earthquakes, oil spills and nuclear testing - even monkey attacks, snake infestations and a bounty of other natural phenomena - the stories in Earthweek are as diverse as nature itself. 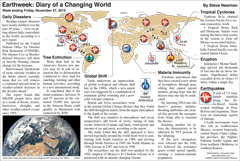 A fascinating and informative read for casual readers who want to keep abreast of world events, Earthweek is also a superb educational resource for students. Earthweek is available as a composed page in color or black and white, and in U.S. and Metric versions. Earthweek is the invention of meteorologist and science journalist Steve Newman. Steve’s career spans more than three decades in broadcast and print media. In addition to being a frequent contributor to ABC’s "Good Morning America" and the Discovery Channel’s Discovery News, he has written about the environment for the San Francisco Chronicle and the Los Angeles Times. In 1980, Newman established Earth Environment Service, a weather consulting company that provided forecasts and data to agricultural, insurance and media interests worldwide. Newman is designated a Certified Broadcast Meteorologist by the American Meteorological Society and is a fellow of the Royal Meteorological Society. He is also a member of the American Geophysical Union and the National Association of Science Writers. Steve now lives in his childhood hometown of Sarasota, Florida, where he recently resumed his TV career as a broadcast meteorologist at the ABC affiliate where his career began in 1971. Steve’s forecasts can be seen on WWSB (ABC 7). 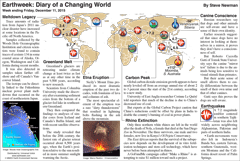 The print version of Earthweek premiered in the San Francisco Chronicle on January 2, 1988, and has since expanded to be published in more than 100 newspapers worldwide. There's no better way to stay in touch with our planet than by reading Earthweek. Like a postcard from home, Steve Newman's weekly compendium keeps readers informed on the big events in our world's environment. 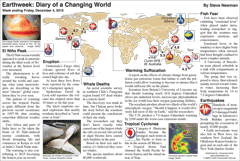 It includes the natural disasters that make headlines as well as breakthroughs in scientific research and interesting phenomena in the animal world that aren't often reported in the mainstream press. Teachers have found Earthweek with its global view to be an invaluable tool for kids learning about world geography as well as science and current events. Anyone interested in breaking out of his immediate surroundings and visiting the rest of the planet will enjoy making Earthweek a regular habit.